I'm not sure if you all notice, but the first thing that jumped out at me when I saw these pictures was my TAN. Wow, the difference a little sun makes. I feel like I'm glowing. Our Bahamas trip coupled with hanging out at the pool every-other-day since we've been back is to blame. I just love summer! Well, summer weather, that is. Heck, I'll take summer weather in the winter, spring or fall--to be clear. What you did probably notice is the new color in my hair. Yes, I have what I dub "Hair ADHD", and I needed a change. Actually, I've decided to cut the annoying cycle of dying my hair black. My hair is naturally dark brown, and will get highlights in the sun. I've been dying my hair jet black off-and-on since 8th grade, and I really want to say goodbye to jet black for good. I read somewhere that as a woman gets older, she should go lighter with her hair color, and I can see why. Lighter hair brightens up the face, softens and warms it a bit. I've lightened my hair many times, and I can attest that when my hair is lighter, I feel less compelled to wear make-up. It just has a way of doing that. Since my hair is permanently stained from the black dye, I usually can't get it as light as I'd like (without major damage), so I usually just stick with a red/auburn. It's red right now because of a rinse, but I will be toning it to a nice medium brown color and will just let my natural color grow in for a while. I may even lighten my ends a bit more at some point for a nice ombré. Either way, the hair world is my oyster, and I'm never scared of taking a risk. 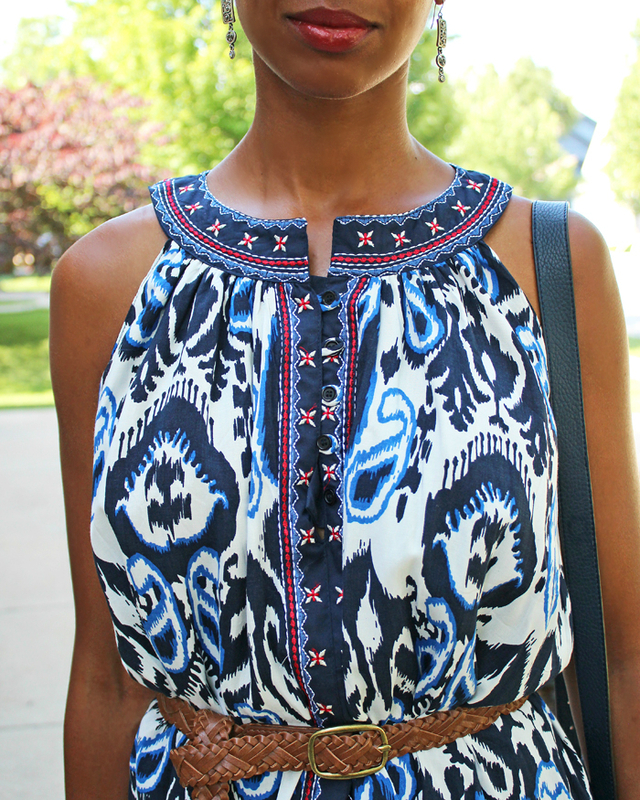 By the way, I'm loving this abstract paisley print dress I'm wearing. I'm a sucker for prints and with the added embroidery, it gives it that "boho" touch that I love so much. The dress is more of a flow-y, "baby doll" style, but I prefer it belted. In person, it looks a lot more expensive than what I paid for it. Can't beat that! I'm linking up with Monday Mingle and How I Spring. I love the dress and your hair! I wish I could change my hair up whenever I wanted - but I have no luck in that department! Love this print in a dress. I love that pretty dress and how you belted it for a more laid-back look--you look so cute and summery! I hope you had fun in the Bahamas, how exciting! You look amazing!!! And love the color! Yessss I love the new hair color! That stood out to me right away. That dress is super cute too! yes yes yes! to that print and your hair color. Looking gorgeous as always, doll!